My last post took me to High Barnet and then Hell and back, the whole point of heading to the far reaches of the Northern line was to experience this pub . And a fine experience it was. However I couldn’t go all that way without visiting a few more pubs, so walking past Ye Olde Mitre Inne I headed west toward The Lord Nelson. Its hidden away from the main road down a small residential side street, of course expecting it to be on the main road I initially walked straight past it. A traditional pub it looked rather splendid in the bright October sunshine. Inside, carpeted and wallpapered, it was a perfect manifestation of a traditional pub, apart from the fact it was almost empty, aside from one old boy sat at the bar. There was a fair bit of bric-a-brack around the place, including a collection of salt & pepper pots as you can see beyond old boy in the picture above, there was also a nautical theme with various models and paintings of sailing ships dotted around the pub. The Lord Nelson is a Youngs pub, so I wasn’t expecting too much on the beer front. I was correct. 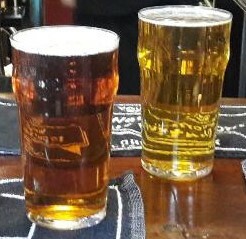 Just the two beers on, ideal for some, but not for me, I needed some hops. A lovely comfortable pub but ultimately a disappointment for me with two rather plain beers to choose from, so I downed my very ordinary pint of ordinary and headed back east. I’m sure someone recommended that pub to me this year. Was it you ? On my list, anyway. Looks a corker. One Old Boy can’t support one pump, let alone two ! Wasn’t me, I know Quinno rated it highly on his Pubs Galore review, It was shortly after opening time on a Tuesday, so I imagine it gets busier.